Your iPhone is capable of doing many things as long as you pick the right apps and accessories for it. Most iPhone owners invest in cases to keep their gadgets protected. In order to attach your phone to a wall or bike, you are going to have to pick up a reliable mount. The Stealth Carbon case and mounts kit can help you out. It has everything you need to use your device at home and in the outdoors more conveniently. 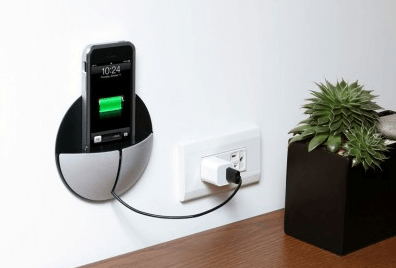 The Stealth Wall Mount enables you to mount your iPhone on any vertical surface magnetically. This could prove useful for those of you who plan to do chats or conduct virtual meetings using your phone. The carbon backing mounts to any wall with 3m adhesive strips or double faced tape. The Stealth Bike Mount lets you attach your phone to your bike’s handlebar magnetically. All these accessories are made from aerospace-grade carbon fiber and look pretty decent. You can support this project on Kickstarter. We had the chance to review the Kudocase for iPad a while ago. It was a solar case capable of charging old iPads using indoor light. It seems the developer is in the process of releasing a new version to the market. The KudoSol will be available for the iPad 4, iPad Mini, and Nexus 7. It will not only protect your gadget but will serve as a keyboard stand, iPad charger, and solar battery case. The solar case we tested a few months ago was well-developed but quite thick. It did charge our iPad but had a few annoying issues. This new case is expected to be lighter and better. We won’t know for sure until we test it. You can keep up with the project on Kickstarter.